They are young, but not that young –and honestly, neither of them think in terms of time: it is a foreign, meaningless concept invented by the weak who must measure the distance between themselves and their deaths– and it is in this world, because it is always in this world; perhaps she does not wander further than the confinements of this strange, round sphere… or perhaps they simply never coincide. It is a land of loud voices and deep, rumbling songs, and here they call her Chalchiuhtlicue, a word that rolls easily off his tongue as if he has spoken it since the beginning of his existence. It means She of the Jade Skirt; and indeed, she glitters as the rippling rivers that gave her that name among these creatures who build large structures of many steps, these people whom he loves fiercely for their fire and their passion, the dancing red of feathers in their hair and the violent stripes of the blood of the dead strewn across the altars. He meets her here, adorned in red and gold, lips curled into a perpetual smile, feet dancing and never truly stopping. 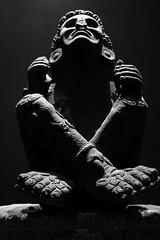 They call him Xochipilli, and he is alive in the curling towers of smoke that rise around them, even as she is in the birthing screams of a mother and in the rising of the tide. And he strays near her, perhaps closer than he ought to, for the babe is born and celebrations abound, and he is dancing, dancing, never stopping, to the rhythm of swishing feathers and heavy footfalls and they call him Flower Prince, and perhaps he is; perhaps he lives in the flowers that bring them ecstasy, even as he presses his lips to hers and tastes the sour taste of sweat and blood and sees the roaring, crashing waves of the ocean in her eyes. And he smiles widely, teeth glinting in the moonlight, dancing, dancing, never stopping, and he forgets, in the bursts of celebratory fire and the dancing bodies that close in around him, if she smiles back. This time she is the one in red, and she wears a thin and nubile body, small lips and coquettish eyes. He is all but nonexistent, walking unseen among the mortals, but he has shown them the magic that can be extracted from rice and spices and he dances among them in dark silks near the shores; and perhaps the mortal ruler has forgotten him now, but he thrives in the thrill of energy that he has extended to the cities near the ocean. He lives in the golden lanterns that fill the sky with wild, fiery light, and he allows them to call him Yi-Di, as he ducks among the long satin bodies of dancing dragons: dancing, always dancing. They do not recognize her here; not among the sea of red that already exists, but perhaps they can sense it: the rise in the tides, the wild crash of the waves on the beach as he reaches for her hands with his own –this time, they are thin and soft– and pulls her into the parade. He whispersSister in acknowledgement and she presses a kiss to his lips in greeting; and perhaps she tastes rice wine in his mouth, a taste foreign to one who only frequents human sailors, but she twirls beside him nonetheless. They call her Silent in this land where waters slide softly beneath bridges, and the mortals chant their thanks to her for their safe arrival, for she has led them into his own welcoming spice-scented arms. He shies away from the wildness of the ocean; it has never brought men much delight, but the salty scent of her skin has faded slightly among the rich perfumes of celebration, and he forgets discomfort as he entertains himself with her dancing, electricity sending tendrils through their skin, and the mortals feel it though they do not know it; it is not common for two such as them to cross paths. They meet in grassy fields in the cold breeze at dawn; the night was spent in celebration and he wears a stronger and more muscular body with fur lining his clothes and a heavy cloak shielding him from the wind. He dances, still, albeit with heavier steps, and does not stop when he sees her leaning against the cliff, hands buried in a net of her own making. Her smile glints with shining gold as she turns to look at him. Brother, she says, and here she is dangerous: Rán they call her, and she drowns her sailors and desires their gold. But he skips nearer, toes brushing against her skin as he stands grinning down at her, perhaps with a scent of mead still lingering about his mouth. He is unafraid, but he has no more left to do in this land of changing tides and strong-hearted men who ride the ocean endlessly, a land of pain and violence. He is bored of the mountains and the water and he longs for other worlds. His name has been Freyr, and the word sticks to his tongue, and he does not like being bored. Men’s handiwork grows too complicated for him; it departs from the classic pleasures of drink and lust and dives beyond his comprehension. Indeed, he has no desire to comprehend it. He lives in their laughter and their euphoria, in the secrets that escape within the warm confinements of forgotten nights, in the sound of drums and dancing feet. He does not live in their pain; he has no need to fashion nets to ensnare the lives he needs to live. So he kisses the air near her mouth and departs, allowing the morning mist to envelop his bare feet, and he leaves her weaving her net beneath the morning sky. Their next encounter, he suspects, is merely an accident. He is landlocked here, and the forests provide heavy, warm foliage that surrounds him at all times; she must have wandered much too far and lost her way. He has never been one to get lost. Though of a curious sort, he bores quite easily, and so it is that she finds him leaning against a rock somewhat near the riverside, and here he is dark and libidinous, with teeth that flash somewhat more cruelly than before, though he takes her hand immediately and presses her to a nearby tree and Sister, why do you wander past your shores? Here, she has no name, though his is whispered through clenched teeth as Kurupi, the hidden creature in the darkness –it is amusing to be feared at times, though behind secretive lips he is also known for ecstasy. Here, she is wild and half-mad with the confusion of the distance, trapped within a body of weakened strength and even weaker countenance. She trembles in his arms and he murmurs his amusement Sister, once you were much stronger, and the thought of it seems to strengthen her. Wild things, brother, await them, she whispers, feet enveloped in water as they lie on the grass together. I have seen the mortals use me for their vessels; they be approaching. But he cares not for the future –past and present are sufficient, who has need for things that have yet to come to pass? – and he forgets it. She takes his lips for her own this time, and even in this insatiable body, he is satisfied. The foliage is bright green and the soles of his feet are stained dull red from the dust of his dancing; and mortals grow old and fade away before she drifts back with the river towards her home. He does not know why they meet so often in this area of this world. He finds it odd to think of matters such as the passion born from the reunion of ocean and revelry; the thought crosses his mind, perhaps, but it is still inconsequential. She is changing, she is untameable, and so he finds intense pleasure in the sight of her among the crowds. He cannot help the longing for her wild familiarity. Life in this world seems to follow the same dull pattern of torturous pain, and it isn’t often that he stays for very long; he tires of tears and the wondrous awe that comes along with his presence… his joy is now a strange delicacy in this part of the worlds. There was once a time, he tells her, when they were not so surprised. There was once a time… she murmurs, and does not finish her words. And it is strange, foreign, to taste words such as time. They are irrelevant: he lives them all at once and sometimes if he closes his eyes long enough he tastes the birth and death of all of those around him –but he doesn’t close his eyes: there is still too much to see. Here, she is a man and he is a woman. Unusual, but enjoyable, and he dances with bright white flowers in his hands, and knows he is Erzulie like this for the first time; because things have changed and though the creatures near him may dance in a dark frenzy of joy, their skin now bears angry red scars. And it is not like being Xochipilli, because the red streaks of blood bear no beauty here: they mar the balance of the foliage and the wind, and he nurses wounds with perfumed smoke and kisses cracked, parched lips. And he loves them fiercely for their beauty and their agony, but there is no wild joy, and their drums are not as he remembers them from once before, before they met Agwé –for here, she is a man– and were forced over the ocean. I am not a warrior, he murmurs into her arm. Here they are spouses, and it is both a truth and a lie on which he spends little time. And the thought is sobering, which in turn disgusts him, for he is one to dance in wild revelry, not think in terms of mortal sufferings. But she will not smile this time, not when her sea-green eyes are flashing in this way. And she smells like rum here, too, and melons that they have offered to her even as they lie starving on cold dust-sodden floors. The strong flesh beneath the dark colors of her skin is in stark contrast to the emaciated bodies he has held in dances to the sound of drums; drums that are, at times, the only thing reminding them of the place from which they came. And perhaps they live in the drums just as much as he does, for a while. He forgets himself soon; forgets the traitorous thoughts of sadness that lurk outside the corners of pleasure. But when he turns away after they awaken and the sun is not yet in the sky, he joins her on a hilltop to watch them file in quiet lines away into the darkness, and he vows never to visit anyone who bears a whip. Lastly, he joins her for a dance through two worlds and two times, and they call her Yemaya and Calypso, and they call him Iroko and Bacchus, and he is all smiles and skin that changes dark to light, but the same glittering black eyes, and she has not changed at all: her brown skin glitters with salt like stars, and her smile is just as playful and inviting as it is dangerous. And one land is filled with bright lawns: he lives in dancing bodies and the sound of piping music, and in it he drowns himself in simple beauty, the likes of which is now much too unusual, though he is loath to admit that he can feel the rise and fall of happiness across the worlds that swirl inside his mind. He leads the women into dance and kisses multitudes of lips and hands and love flourishes at his touch and with the grapes they share. Here she is less significant in mortal eyes; her dress is coarse and if she sits too still upon a rock he might mistake her for statue. But it is a time when mirth and the ocean crash together, and so she is quickly lost within the dance as much as he is, and when they linger near the saltwater he doesn’t shy away from it quite as much as he may have, once. With the wild, uncontainable waves, at least, he can relate. Sister, he calls again in little more than a breath as they advance through sleeping bodies on the lawn; the night has ended and exhaustion takes the mortals’ bones, burying them in sleep. She takes his hand and he enjoys the strangeness of her fingers, icy cold yet made of fire, and they depart in silence towards the land that has now called them. And he feels with strange suddenness as if he is missing something. The pain of mortals does not concern him, nor has it ever attracted him. But bliss is what he sees in Sister’s eyes as she watches a child sleep in its mother’s thin arms; and he sees the scars of what once must have been shackles carved into the woman’s bones, and wonders at the joy that bursts so forcefully through pain. And then he takes her hand, and they leave to explore worlds still far away, and he makes sure that he will forget, but perhaps he doesn’t, not entirely. Originally posted for rthstewart in AO3, as a Chronicles of Narnia/Pirates of the Caribbean crossover based on Bacchus and Calypso… except it sort of became original fiction somewhere along the way. The civilizations/cultures mentioned here are: Aztec, Chinese, Norse, Guarani, Vodou and Yoruba. I hope none of them mind my fictionalization of their mythology. Which one of my works? lol Rules of the Altar got published some months ago (the link should be working now! ), I’m posting stuff semi-regularly here, and my fanfiction works in my portfolios you can see in the ‘my works’ section 🙂 I don’t have anything big on the way to publishing yet but who knows? Maybe soon!